Silverfish & Springtails Will Eat Anything! Silverfish consume matter that contains polysaccharides, such as starches and dextrin in adhesives. These include glue, book bindings, paper, photos, sugar, coffee, hair, carpet, clothing, dandruff, tapestries, cotton, linen, silk, synthetic fibers and dead insects. During famine, a silverfish may even attack leatherware and synthetic fabrics. Silverfish can live for a year or more without eating. Although they are responsible for the contamination of food and other types of damage, they do not transmit disease. License to Kill pest control provides comprehensive residential pest control protection plans. 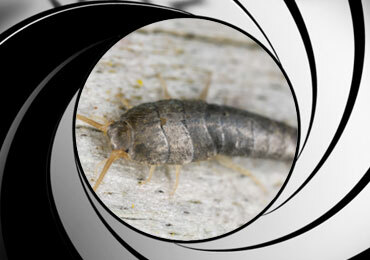 We specialize in silverfish pest control. We have extensive experience eliminating silverfish in historical structures, apartment complexes and commercial properties. At License-To-Kill, we understand pesticide sensitivity. If you’re allergic to pesticides, concerned about your pregnancy, pets or children, we care and are prepared to work with you. Please call us for your pest control needs today. Get Rid Of Your Silverfish Today!